except one pink sad face emoji on the lower right. Smaller text in white script reads, "Rachael Lucas"
The State of Grace is a young adult novel narrated by Grace, a fifteen-year-old high school student who deals with common teenage issues like dating, friendships, family conflict, and birthday parties, while also being autistic in a world not designed for autistic people. Grace is a well-rounded and sympathetic character. She has various interests (horses, wildlife, Doctor Who, My Little Ponies), rides and cares for a horse, has friendships and complex relationships with her family members, and has a good—and sometimes entertainingly snarky—sense of humor. She's introspective and insightful about how being autistic affects her needs, such as extra recovery time after social interaction and the ability to leave stressful situations. She also has a good sense of how others' willingness (or refusal) to accommodate those needs affects her ability to deal with everyday life. She also has other issues common to autistic people, including sensory overwhelm, sleep schedule dysregulation, difficulty interpreting others' imprecise or implicit communication, and difficulty providing other people with the responses and body language they expect. Grace's descriptions are given in ways that autistic readers will connect with, and with enough detail (as far as I can tell) for neurotypical readers to understand what it can be like to be autistic while having to deal with the demands of ordinary life—a careful and impressive balance. The focus on Grace’s experience also carries through in what’s made obvious to the reader and what isn’t. For example, there's something going on with the mother's new friend being a bad influence, and it wasn't clear what was going on until Grace learned more later. This is a refreshing change from portrayals where an autistic character's social difficulties are shown by their failing to understand something made so clear to the reader that the character seems to be ignoring obvious truths. Instead, The State of Grace shows something more accurate: Grace has difficulty detecting and processing cues relevant to accurately understanding (some) social situations. Because the novel stays in her experience, the reader isn’t being provided with the neatly prepackaged information that a neurotypical person might perceive; they’re seeing the same genuinely ambiguous information that Grace is. That means Grace comes across as someone who’s doing her best despite not having all the information she needs, instead of being portrayed as having all the information she needs but inexplicably failing to draw the obvious conclusions. This will ring true for many autistic people, and give many non-autistic people an accurate window into a common (and frustrating) autistic experience. This is a very effective window on a particular aspect of autistic experience. In some areas the book edges into a "burden" trope, particularly with respect to Grace’s thirteen-year-old sister Leah. Both Grace's grandmother and Grace think her mother has overburdened Leah, because Leah is "sensible" (147); Grace's mother justifies this by saying Leah is "the capable one" (149) compared to Grace. Her mother has made Leah responsible for looking after Grace at times in the past. Grace's mother is also shown as having to choose between getting a job (which she wants to do) and staying at home to take care of children, although it's not clear that she actually needs to. It's also stated that "the voluntary stuff she does with the local autism support group takes over her entire life" (23). These read to me as suboptimal parenting decisions by Grace’s mother, rather than something inherent to Grace being autistic, but someone who came to the book exposed to the stereotype of autistic people as burdens might interpret it as consistent with the stereotype. It helps that Grace's narrative make it clear that being autistic affects her far more than it affects others. This reflects autistic people’s real-life experiences: it is harder to be us than to be our family members. There are also several incidents where Grace creates or contributes to situations where others are harmed, or narrowly escape harm. In one case, she shoves her sister into a wall after an unrelated argument with other people, because her sister’s "in the way and she's always so perfect and I hate myself" (97). In another, she makes an unwise decision while trying to impress a friend group, and isn't able to stop herself in midstream despite knowing it’s a bad idea (a type of executive-function failure that I can relate to). The third incident seemed like a bad decision that a non-autistic teenager could have easily made, and unrelated to her being autistic. Her sister, mother, and friends readily forgive her, and no one talks with her about what she could do differently to prevent the same things from happening again. She feels terrible about each incident, but it felt like she was being let off unusually easily, or that they didn't think she’d be able to do better, and I wished they’d been portrayed as having more respect for her ability to change. In real life, autistic people sometimes need more tolerance for mistakes because we have difficulty regulating our behavior in certain situations, or because we don’t always read situations well. And there are things it isn’t realistic to expect us to do—for example, we can’t stop a meltdown in midstream. It’s important to not try to make us change things about ourselves we can’t change, and it’s also important to recognize that we can (and should, and generally want to) figure out why we made avoidable mistakes, so we can avoid making them again. Apart from the above issues, Grace's relationships with others were portrayed well. Her mother felt like a realistic mixed character, someone who messes up but also works to do better. She doesn't always understand Grace's perspective, but plays a supportive role; Grace says her mother "might make me want to scream sometimes, but she is good at recognizing when I've hit the wall and keeping me from losing it" (37). Her relationship with her best friend also felt realistic. The friend, Anna, is described as the kind of person who is friends with everyone. She also helps Grace with some social stuff, e.g., interpreting ambiguous text messages. Although not universal, this is a common real-life friendship pattern I've seen described in non-fiction. Grace also mentions some reasons why Anna is friends with her: she makes Anna laugh and they have shared interests in fandom. This lets us see their friendship is not one-sided. Grace connects with her love interest, Gabe, partly through shared fandom. Since shared interests are a common way for autistic people to develop meaningful relationships in real life, I appreciated it being portrayed here. Similarly, it’s common for us to become friends with other neurodivergent people, and Gabe has ADHD. There’s a charming scene where Gabe shares some of his ADHD-related experiences with Grace, and Grace tells him she’s autistic; he then asks her what it’s like, and listens when she tells him. One thing that stood out to me was Grace’s lack of connection with other autistic people, especially since her mother volunteers with an autism support group. She also doesn't seem to access any online resources or read any materials by or for autistic people. Although the book's time period isn't given, because it doesn't reference social media and Grace and her friends only use their phones for talking and texting, it comes across as set before the proliferation of communities and materials by and for autistic people in the last 5-10 years. This isn’t a problem with the book per se—but I wouldn’t want anyone new to reading about autism to walk away from the book thinking that Grace’s relative isolation from other autistic people is a reasonable default state. 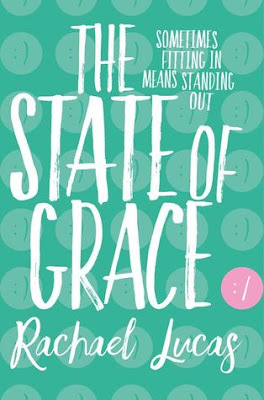 Overall, though I had some concerns, they were outweighed by the realistic, sympathetic, detailed portrayal of Grace's experiences; the book clearly shows how and why our experiences can differ from neurotypical people even when we’re ostensibly in the same situations. Speaking personally, I felt the book offered a glimpse into what my life could have been like if I'd been diagnosed when younger (but not subjected to ABA, or at least pulled out of it quickly) and had a supportive neurotypical friend. Grace's awareness of herself as autistic helps her calibrate her understanding of her own needs realistically, and understand why the world is particularly difficult for her—something that would have been incredibly helpful to me at the same age. Autistic people vary a great deal, and we'll vary in how much overlap we have with Grace. That said, I would recommend this book both for autistic people looking for something to connect with, and for non-autistic people looking to understand autistic experiences better, with a caveat: Point them toward additional resources by autistic people. Learning from and connecting with autistic people is important and very helpful for other autistic people, as well as for their family members, whether autistic or neurotypical themselves. I would recommend Kit Mead's list of autism resources as a good starting point. Two content notes for the book: some alcohol abuse by family members; two brief references to past ABA-like therapy; potential harm to an animal.